A Polish non-government organization has launched an eye-catching campaign aimed at dispelling the common assumption that Nazi-era death camps in Poland were run by Poles. The use by foreign media of the phrase “Polish concentration camps” has became particularly galling to Polish citizens and the country’s government. In effort to stamp out the association, the Town and Country Tradition Foundation has mobilized a rolling billboard depicting the Auschwitz death camp merged with Hitler’s signature haircut and mustache together with the slogan, in English, saying “Death Camps Were Nazi German,” Radio Poland reported Thursday. “The idea of our campaign is simple. We demand the historical truth, we oppose the use of the term ‘Polish concentration camps,’ which is commonly used by Western media,” said Dawid Hallmann of TCTF. The billboard is to be driven through Germany and Belgium before making its way on to Britain. Poland was attacked and occupied by Nazi Germany in World War II, losing six million of its citizens, including three million Jews in the Holocaust. Polish officials routinely request corrections when global media or politicians describe as “Polish” former death camps like Auschwitz set up by Nazi Germany in occupied Poland. Even if used as a geographical indicator, Warsaw says the term can give the impression that Poland bore responsibility for the Holocaust, whereas it was one of the greatest victims of the slaughter. Last month Poland published the first online database with the names and other personal details of nearly 10,000 staff who ran the Auschwitz-Birkenau Nazi German death camp. 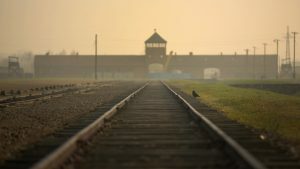 The database, which the IPN says contains 9,686 names, “is just the beginning of a wide-ranging project” that will cover the staff of other death and concentration camps that Nazi Germany set up in occupied Poland, Institute of National Remembrance chairman (IPN) Jaroslaw Szarek told reporters in Krakow at the time. In August 2016 Poland’s rightwing government said it would seek fines or jail terms of up to three years against anyone who refers to Nazi German death camps as Polish. Under the new initiative, a “public attribution to Poland, in violation of the facts, of bearing joint responsibility” for Nazi Germany’s crimes could result in jail time, as well as fines.